The best ways to cover a webcam. What’s the Best Way to Cover Your Webcam? James Comey covers his webcam and you should too. This week, FBI Director James Comey reaffirmed a position he’s expressed in the past, claiming that he covers his computer’s camera with tape. 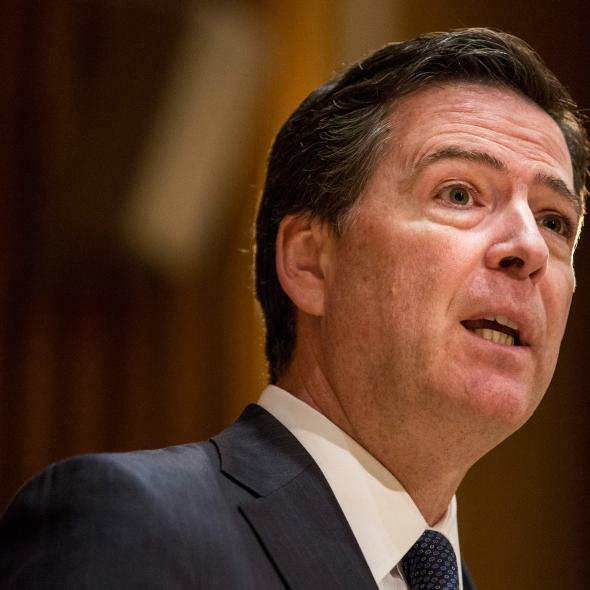 “I think people ought to take responsibility for their own safety and security,” Comey proposed at a Center for Strategic and International Studies conference, according to the Hill. Comey’s not alone in that commitment: Mark Zuckerberg supposedly obscures his laptop’s camera as well, and as Will Oremus points out, he’s right to do so. Covering your camera may make you look paranoid, but webcam snooping is very real, especially for powerful figures like Zuckerberg. Back in 2013, Tyler Lopez made just such a case in Future Tense, writing, “almost anyone—from foreign governments to the creepy teenager down the street—could be recording you while you sit at your computer.” The following year, documents leaked by Edward Snowden indicated that the NSA uses plug-ins to hijack cameras, information that surely informs Comey’s own decisions. Here, however, is where I admit that even knowing all of that, I’ve never covered my own camera. Spurred by Comey’s latest statement, I realized it was time to change my ways. The only question was how. Like Oremus, I hope that computer manufacturers will start adding physical covers to machines, though we shouldn’t expect them to do so any time soon. In the meantime, you can buy physical covers online, sure, but having already delayed too long, I wanted something fast. In an attempt to determine the best option as quickly as possible, I quizzed others at Slate and raided the magazine’s supply closets for materials. Flexibility: Since I routinely use my computer’s camera for video conferencing, I need an option that I can take off and put back on again without much effort. Adhesion: Simply put, I want my covering to stay on, but I also don’t want it to be so sticky that it leaves goo on the lens when I take it off. Opacity: I want a cover that will actually block the camera’s functionality.  Looks: While webcam paranoia is clearly warranted, I’d rather not have a covering that actively broadcasts my fears. It would be nice if it looks cool too. With those expectations in mind, I’ve rated each of the options below on a scale of one to five shadowy emoji silhouettes. Post-It Notes: In the past, I’ve noticed that a few of my colleagues simply employ a torn-off fragment of a post-it notes. My own testing indicated that this option was highly contingent on the hue of the paper itself, since lighter shades (including the common yellow varietal) may let enough light through to capture the hint of an image. This option also inclines toward the ugly, since the tattered squares stand out on my computer’s frame. Finally, the adhesive on the notes I tested seems weak enough that it seems as if it would come off easily during ordinary usage of my machine. Duct tape: Short of permanently destroying your camera, this may be the most brutally effective method. My testing suggested that nothing’s going to get through, but its pragmatic qualities are arguably surpassed by its ugliness. In that regard, it’s probably the closest equivalent to a tinfoil hat on this list. Further, one Slatester reported that it left a sticky residue on her camera at first, though that effect faded in time, even as the tape itself remained adhesive. Painter’s tape: Designed to go on even and come off clean, painter’s tape—Oremus’ favored option—just edges out duct tape. It may, however, be harder to find. What’s more, the classic blue shade may be even more unpleasantly inelegant atop monitors. Cute cat stickers: One Slate editor protects herself with adorable stickers that depict kittens dressed up in sushi costumes. Just the right size and featuring a pull tab on top that makes removal and reattachment a cinch, they seem ideally designed for this purpose. Indeed, she’s been pulling hers on and off for months, and it still hasn’t lost its stickiness. She offered me one to try (I chose a puffy-faced kitten adorned with spicy tuna sashimi). Alas, the sticker I tried was sufficiently translucent that my camera was still able to capture a phantasmatic image of me (see below). My editor’s slightly darker sticker seems to work a bit better, and even the one I chose would likely be enough to make any images pulled from my camera relatively useless. It’s a charming method, then, but maybe not the most secure if you really want to prevent hackers from checking in on you. There are plenty of other similar stickers available online, but be sure you know what you’re getting into. Invisible tape: While you would think that a translucent barrier would be ineffective, the invisible tape I put over my computer’s camera actually obscured the resulting image better than the more colorful sticker I tried, though a faint outline was still visible. Significantly, the tape also largely disappeared against my computer’s frame, while still making it easy to tell when the camera’s activity light was on, making it an ideal option for paranoiacs who don’t want to publicize their paranoia, but do want to know when they should be paranoid. If anything, though, it was so hard to see that I worry I might forget it was there, which could be a problem when I actually need to use the camera. And when I did try to take it off, I found that it was difficult to remove: By the time I had gotten it off, I had destroyed it so thoroughly that it was unusable. Washi tape: Recommended by Slate’s resident stationery-head June Thomas, washi tape is typically used to decorate envelopes, journals, and other paper products. Like painter’s tape, it peels off easily, but unlike that more industrial material, it comes in a wide array of shades, prints, and other colorful designs. As such, it may be an ideal—even attractive—option for those who want to turn cybersecurity into an opportunity for stylish self-expression. Thomas’ chosen tape also features a print that helpfully reminds us why we’re doing this in the first place. 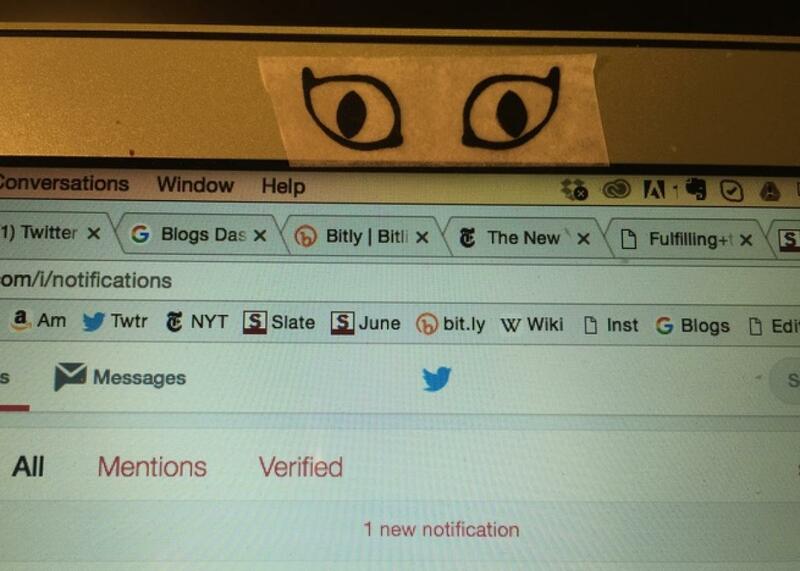 June Thomas’ washi tape covered monitor is still watching her.